Lillies: Cause acute kidney damage and failure in cats. All parts of the plant are toxic and the cat potentially only needs to eat a mouthful to become sick. 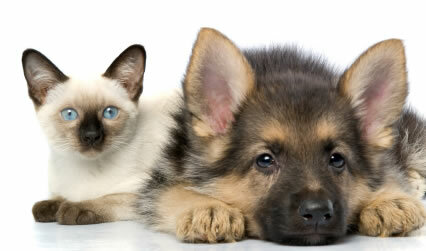 Onions/Garlic: Either of these foods can cause life threatening anaemia and liver damage in your dog or cat. Onions are particularly bad and can cause anaemia if consumed in any form i.e. cooked, raw, dehydrated, etc. Chocolate: Causes many signs of illness including vomiting, diarrhoea, fever, inco-ordinated gate, increased drinking and urination, and eventually heart rhythm irregularities, laboured breathing, seizures, coma and death. Cocoa powder and cooking chocolate are the most toxic varieties but your pet may just as easily become ill after eating milk chocolate. Grapes/Raisins/Sultanas: Cause vomiting and diarrhoea and ultimately kidney failure and death. The number of grapes that need to be consumed varies between individuals and may be as little as one grape or as many as a pound of grapes. Furthermore, dogs that have eaten grapes before without consequence can suddenly become affected after consumption. Macadamia Nuts: Cause vomiting, depression, and temporary muscle weakness/ paralysis. Again, the amount that needs to be consumed to cause illness varies between individuals. Macadamias also commonly cause gastro-intestinal blockages requiring surgery to remove the lodged nut. Avocado: Affects predominantly rodents, livestock (including horses), guinea-pigs, rabbits and caged birds. Causes damage to the heart which can lead to subsequent difficulty in breathing, cyanosis and death. At lower doses it has the potential to cause a sterile mastitis in lactating animals. Essentially any part of the plant can be toxic. Paracetamol (e.g. Panadeine): Many people are unaware that most human medications are unsuitable and potentially dangerous to their pets. Cats lack the enzyme necessary to metabolise paracetamol and if ingested this drug blocks the bloods ability to carry oxygen and ultimately leads to organ failure and death. These common household items and their potential danger to your pets health highlight the importance of securing drugs and food items as well as refraining from ‘spoiling’ your pets with table scraps and human food. By avoiding these harmful items your pet will be able to enjoy the warmer months and longer days with you. We are more than happy to discuss any of your concerns or questions. Please do not hesitate to contact us for further information or alternatively, have a look at our website www.ansteadvet.com.au.